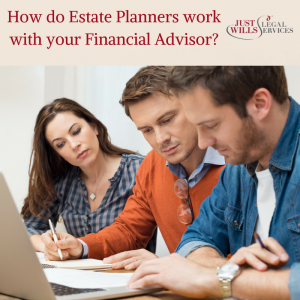 How do Estate Planners work with your Financial Advisor? When it comes to protecting your wealth, your financial advisor and estate planner will work hand in hand to ensure that you can pass down your estate to your heirs in the most efficient way. Quite often your financial advisor will be the stepping stone between you and the estate planner. They make sure the estate planner stays on track to deliver the best possible plan tailored to your individual circumstances whilst de-coding the jargon and helping you put this plan into place. It all starts with a long and in-depth discussion between you and the financial advisor and it’s here that you lay all your cards on the table. Your financial advisor will gauge what makes you tick and dig deep into what your financial goals are. The result will be a detailed description of the financial positions you want to be in at various points of your life. Advice will be given on how to achieve these goals such as how to invest wisely in order to create a stable income and how to plan for retirement with the pension savings options available to you. This plan will also include details of how you want your estate to be distributed after your death. This means that the financial advisor is in the perfect position to collaborate with your estate planner in order to ensure that your financial goals are met. The estate planner will require a list of your financial assets and debts, your current and expected incomes and expenditures and details of any insurance you may have – all of which are clearly explained by your financial advisor. Without this, the estate planner will not be able to develop the best possible plan that caters to your individual circumstance. This collaboration will mean that you will have peace of mind knowing that you have financial plans and contingency plans in place to ensure a steady income (and therefore your desired lifestyle) at every point in your life, and that you are saving where you can on inheritance tax when passing down your estate to your loved ones, amongst other things. Options that you are currently not aware of may be developed between the two professionals which could lead to your goals being fulfilled and then some! It’s important to realise here that the financial advisor does understand the role of the estate planner and how they develop and execute their strategies. Constant feedback to you from the financial advisor will ensure that these plans are explained in regular English language so that you can stay on the same page as the professionals through every stage. As a result, it also means that the financial advisor can help you understand the projections of these plans and explain where they will take you in the future. Comparisons to your initial outlined goals can then be made and further discussion or changes can take place if required. Having a healthy and functional relationship with your financial advisor before embarking on the journey of estate planning can reap rewards. It will mean that the estate planner can work much more efficiently and that strategies will be tailored accurately to your specific circumstance. To, book a free consultation with one of our estate planning experts across the UK; book online or call 01342 477 102 and quote ‘How do Estate Planners work with your Financial Advisor Blog‘.